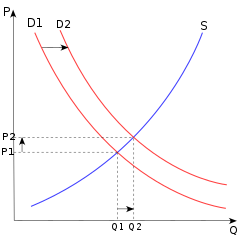 The price (P) of a product is determined by a balance between production at each price (supply, S) and the desires of those with purchasing power at each price (demand, D). The diagram shows a positive shift in demand from D1 to D2, resulting in an increase in price and quantity sold (Q) of the product. Supply and demand is a model of microeconomics. It describes how a price is formed in a market economy. There are two determining factors on such a market, the number of things made available, called supply, and the number of things consumers want, called demand. Supply and demand shows how producers and consumers interact with each other. This relationship will fix the price for a certain type of good. In Perfect competition, the quantity demanded (demand) and the quantity supplied will be equal. This will fix the price. There will be economic equilibrium. If the demand increases, and the supply remains the same, there will be a shortage. This will mean the price will increase. If the demand decreases, and the supply remains the same, there will be a surplus. This will mean the price will go down. If the supply increases, and the demand remains the same, there will be a surplus, and the price will go down. If the supply decreases, and the demand remains the same, there will be a shortage, and the price will increase. When there is more supply, this will cause prices to fall because people will not want to pay more for items that can be found easily. When there is more demand, prices will go up because many people want to buy the same item but there is not enough supply for it. When demands for new goods and services go up, new markets come into being. The greater the demand, the faster this happens. This greater number of providers makes the supply go up, which forces the price down toward the cost of production and distribution. One of the first to see this was Adam Smith. In his book The Wealth of Nations (1776), he says that the demand was dependent on the price of a good. He did not see the inverse, that the demand also influences the price. David Ricardo published the book Principles of Political Economy and Taxation in 1817, where he explained market equilibrium as it is explained above. Others who are known for this model are Alfred Marshall and Léon Walras. A Giffen good is one where people consume more, if the price for a better good rises. There are certain goods which people buy to display their wealth or spending power. These goods are called luxury goods, and the effect is known as conspicuous consumption. In economics, the goods are known as Veblen goods. The rules above are only valid for a perfect competition market: In such a market, there are many buyers and sellers, and no single buyer or seller can directly influence the price. If either the buyers or the sellers can influence this price, the market will react differently. Sometimes there is only one supplier (a monopoly). When this happens, the supplier chooses the price and the demand only determines how much is bought. The supplier will probably raise the price very high as long as people are still willing to buy at that price. If there is only one buyer, the market is called monopsony, and that buyer is able to fix the price. Supply and demand by Hubert D. Henderson at Project Gutenberg. This page was last changed on 22 November 2014, at 10:57.